Angry Mob Games' competitive fighting game Brawlout is now available on Steam's Early Access program. 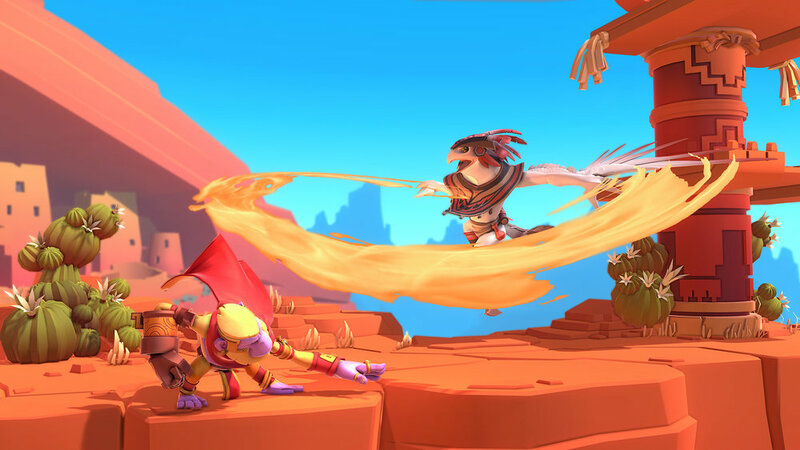 A game designed for couch and online play, Brawlout is pretty much aiming to be the Super Smash Bros. game alternative for those on the Windows platform. And seriously, more Smash-like games are welcome. “The launch on Steam Early Access is only the first stage in building the Brawlout universe, as in future updates we plan to release a story campaign and single-player challenges, along with more characters, gameplay features and other surprises” says Bogdan Illiesiu, CEO of Angry Mob Games. It's not complete, but the core gameplay seems playable and pretty appealing for those interested in a platform fighting game. It is said to launch with an initial six fighters and the game will be able to host up to four players in either online or local battles. Modes, similar to Smash, can be picked from either time, stock or team battles. The goal is simple - knock your opponent off and be the last one standing. Players build a Rage Meter, which fuels special attacks, which I assume makes it easier to knock players off the stage. It's that kind of fighting game so expect wavedashing and air dodging to be among the mechanics to get used to once you start playing Brawl Out. Aside from local and online multiplayer, Brawl Out will feature ranked ladders, private lobbies, and Brawlout TV - a way to watch on-going matches live with featured replays. There will also be in-game support to stream future tournaments. Depending on where you are, Brawl Out is available on Steam Early Access for $19.99, £14.99, or €19.99. For more information on Brawlout, visit the official site. Angry Mob Games will also release Brawl Out on the PlayStation 4 and Xbox One sometime in Q3 2017.